We will begin this page with two color photos so you can look at the corners and see what Mortise&Tennon corner means. Then there will be a lot of product info on this page. In the upper border are navigation links to all pages within the Woodmont Doors section of our web site. Some will give you advice on hinges, measuring, installing, etc. We do offer options for on-line quotations and fax quotation requests. All quotations are done by us, not a robot. Allow us a day or two, sometimes three to get back to you. Design 400 door, S frame RB edge. Min. width 6-1/2", min. height 6"
Design 401 door, S frame RB edge. Min. width 7-1/2", min. height 7-1/2"
This is what the door designs look like "from the front." Series 200 raised panel doors are also shown in this picture. Series 200 and 400 are 5-piece doors, the frames are the same, the edge choices are the same. Series 400 come with a plywood panel and are commonly called Shaker Style doors. CHOICES in arch top doors and a few other designs shown in the second picture down make the Series 400 doors loaded with options. Every design is available in every wood choice listed lower on the page, and can come as UNFINISHED, or in one of the finish options available for the wood choice selected. And below is what the door frames look like if you sliced the frame and looked at it straight on from the edge. All door designs in Series 400 can have whichever frame you like best. The DEFAULT frame size is 2-1/8". For wider frames, 2-3/8" and 3" are available. Look at the coding and sizing beneath each frame choice. Example: Frame S is 2-1/8", SL is larger, thus 2-3/8", and S3 is the 3" version. Follow that across for the other frame choices. Again, the default size is 2-1/8" and it will cost less than the 2-3/8" or 3" wide frames. AND NOTICE THIS, the door and drawer front minimum sizes increase with wider frames. We have also added several notes within the graphic below too. Most Series 400 doors can come as frame only and in mullion options too. 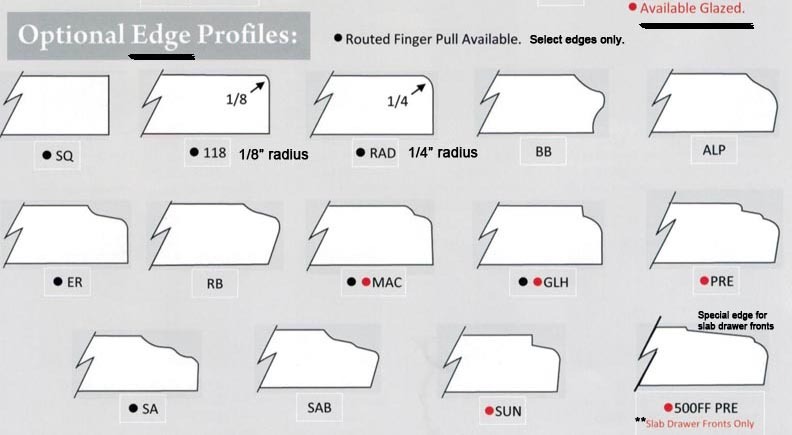 The below graphic are the Edge choices for Plywood Panel doors, Series 400. You will select a frame from above, and an edge from below. Plywood panel default is a smooth panel. Beaded plywood panels are also available. Beaded plywood panels can be glazed.. Door pricing is done via a request on our on-line quote form, fax form, or over the phone (for short lists). And yes, the cabinet doors and accessories can be shipped ANYWHERE in the USA. Doors can be shipped to Canada and other countries too. 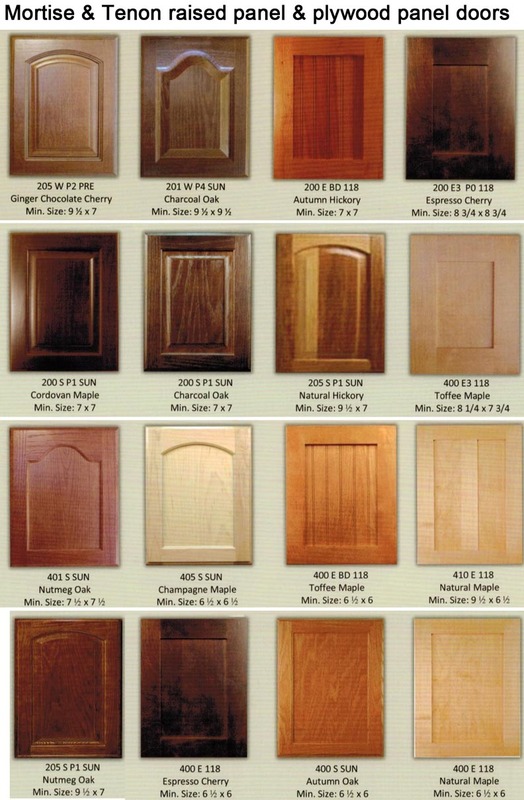 All doors and drawer fronts are available in Red Oak, Maple, Cherry, or Hickory woods. Paint grade available too. Paint grade will come as a default: Paint grade with wood panel. But paint grade is also available with an MDF panel. And of course all woods, including paint grade can come as frame only or mullion doors. Doors can be ordered unfinished, or you can request finishing from the choices available. If you are planning to order "finished" doors, please select this link to view the finish choices . The page will open in a new browser window or tab so you can flip back and forth easily. If you are planning on finishing the doors yourself, or your contractor or cabinet maker will finish them, then ignore looking at that page. Moldings, veneer, and cut to size finishing plywood. There will not be pricing posted on the individual door pages. Please request a no-obligation quotation via on-line or via fax. We can do "small" door quotations over the phone, but do not call us with a big long list. That is more suited for submission via on-line. PLEASE READ OVER THE NEXT PARAGRAPH for the info we need to provide you with an accurate quotation. Below will just be additional color door images to assist you with your selections. The main information about choosing your door and drawer fronts, measurement minimums, and all order data is from this point UPWARD on the page. Design 400 door, S frame RB edge, with B beaded panel. Shown in Wheat Oak finish. Design 401 door, S frame RB edge, with B beaded panel. Design 405 door, S frame RB edge. Min. width 6-1/2", min. height 6-1/2"
Design 405 door, S frame RB edge, with B beaded panel. Design 400 door, E3 frame, 118 edge. 3" wide frame choice. Available on all series 200 and 400 door frames. Standard size is 2-1/8". Mid size is 2-3/8". 2-3/8" and 3" frames carry an upcharge. Shown in Cider Cherry finish. Min. width 8-1/4", min. height 7-3/4" because of the 3" wide frame choice. Shown in Cordovan Cherry finish. 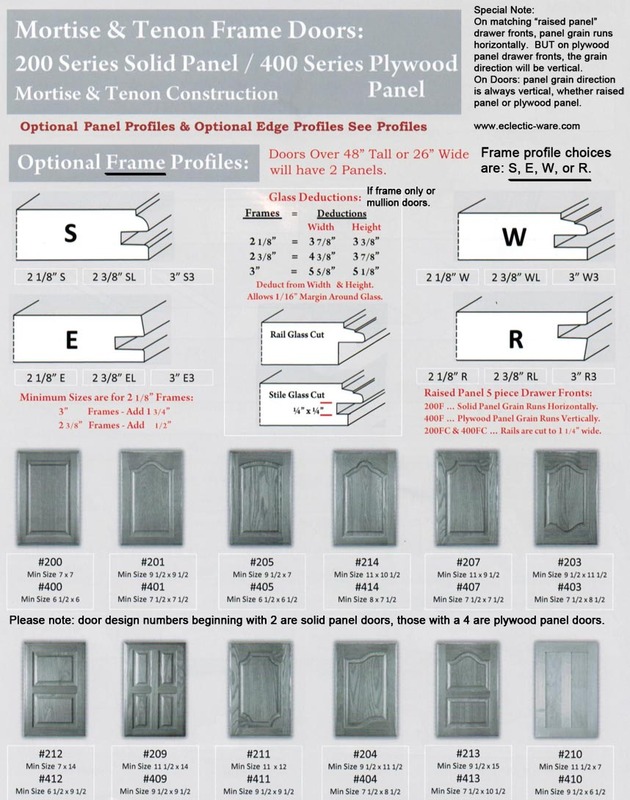 Design 400 door, E frame 118 edge. The ever popular Shaker style door. Shown in Autumn Oak finish. Design 500-118 slab drawer front shown above door. Min. height requirement for this style of drawer front is 3-1/2"
5-piece plywood panel drawer fronts for design 400FC shown to the right must be at least 4-1/4" tall. For design 400F drawer front where all 4 frames pieces are the same width, min. height is 6". If you increase the frame widths as shown to the right, then the min. height and width requirements increase also. Autumn Oak veneer on face frame. Design 400FC S3-118 drawer front. Notice that top and bottom rails are narrower than left and right rails. Door: Min. width 8-1/4", min. height 7-3/4" because of the 3" wide frame choice. Drawer front: Min. width 8-1/4", min. height 6" because of the 3" wide frame choice. Drawer front 400FC made with the normal 2-1/8" wide frame has a min. height requirement of 4-1/4". Shown in Natural Maple finish. Min. width for E3 frame 8-1/4", min. height 6"
Shown in Ginger Cherry finish. Design 410 double shaker style door. Shown in natural finished maple with frame profile E and edge RAD. Min. width 9-1/2", min. height 6-1/2"
Close up of profiles for design 410 shaker door. Hello John, Just wanted to let you know that the cabinet doors arrived safe and sound. And on top of that, they are beautiful and very nicely done. Great woodwork, the finish is spot on. And of course, thank you for your service. Me and my wife are both very happy. Ricardo J., Country of Macau (near Hong Kong) - ordered design 405 doors and 400FC drawer fronts in Toffee Maple..
Michael S., Scottsdale, AZ - ordered more Woodmont Doors. captions are contained within the pictures. Any reference to the SQ edge is now ordered as edge #118. Door choices, measuring and installation information, hinge info, and quotation and ordering links are in the top margin of this page. Scroll back up.